Satellite navigation systems are being blamed for caravanners getting stuck in a narrow lane in a Gwynedd village. People in the beer garden of a pub in Llandwrog near Caernarfon helped one family of five when their caravan became jammed between two walls. They were only the latest tourists to end up in a fix in the alley known as Lon Gul, or narrow lane. A warning sign may now be put up at the entrance, but the community council wants it closed to all vehicles. 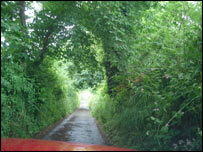 "This is an ongoing problem," said Gwilym Jones, who lives at the entrance to the lane. "I spoke to one of them (a driver) and he told me he was trying to get to Dinas Dinlle beach and his sat-nav had directed him into the lane. "Another one had to unhitch his caravan and move it into someone's drive so he could turn his car around. "It's easy to say they should have more common sense, but really if they don't know the area they have no reason to doubt what the computer is telling them," Mr Jones added. A Gwynedd County Council spokesman said various options were being looked at to make sure the lane was safe for all users. A council officer will visit the site to see whether extra signs are needed to warn motorists about the width of the road. A family of five got into difficulties on Friday evening before they eventually got out after villagers helped them unhitch their caravan and pushed it clear of the lane. 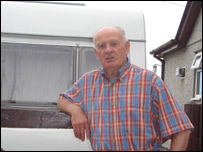 "There was an awful mess on his caravan, scratches all over, and the plastic flaps that cover the water inlet had been ripped off," said villager Ann Owen. "I really felt for him," she said. 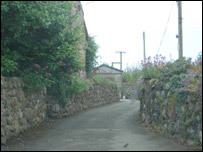 Local community councillor Tommy Williams, who runs a caravan park at a nearby beach, said he had asked the county council to put up a sign saying the lane was unsuitable for caravans. "I haven't had people arriving here telling me they've been stuck, but I think it is better if people follow the directions we send them when they book rather than depend on their sat-nav," said Mr Williams. "We have another site on the Lleyn peninsula and if you followed the sat-nav directions to get there you would have to go over a wall to get in," he added. A spokesman for The Caravan Club said its technical department sent a sat-nav comparison guide to their members. But it warned people that because the systems were still relatively new they were "useful but not quite there yet," and advised members not to depend entirely on the systems while travelling to sites.